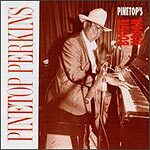 CD review: "Pinetop's Boogie Woogie"
This is a nearly flawless album by one-time Muddy Waters pianist Pinetop Perkins. It could be because he's joined by fellow Waters' band alumni James Cotton on harp, Jimmy Rogers and Hubert Sumlin on guitar, Calvin Jones on Bass and Willie Smith on drums. Of course, it could also be the excellent selection of songs, including blues classics such as "Caldonia," Eddie Cleanhead Vinson's "Kidney Stew" and Roosevelt Sykes' "Sunny Road Blues." Probably, though, what makes this album so good is the fact that at 70-plus years of age, Pinetop Perkins is playing and singing as well as he ever has, laying down an accessible yet classic style of blues that never goes out of style.